© Aleksandar Nikolov – Fotolia.com All rights reserved. We shouldn’t hit our kids. I raised two sons to adulthood without ever needing to really hit them. I thought it was due my good parenting skills. Now I know better. Some children are simply more accepting of authority. 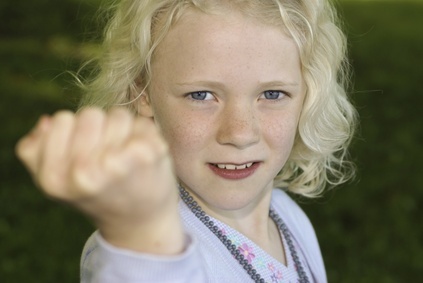 For a variety of reasons, they are less aggressive and violent than some other children are. I saw an undisciplined four year old bite a daycare worker’s arm so hard that she swung her fist around and banged him in the head to make him let go. It worked, but she was appalled that she had reacted by hitting. We really shouldn’t hit our kids, but there are limits. I saw another four year old, a really big overweight brute of a boy, abuse the other children daily. The daycare staff patiently used a variety of standard non-violent responses in futile attempts to control this boy’s violent behavior, but it was clear that the boy enjoyed the extra attention his behavior got him. The response of the adults had become a reinforcing part of the cycle of violence. The adults’ patience seemed endless, and it was at the expense of the other children. After a few days of seeing this bully terrorize my daughter, I was angry and desperate. I began to fantasize solutions. Using a doll at home for practice, I instructed my three year old on how to smack him in the face, hard, the next time he attacked her. Eventually she did, hard, and the initial look of surprise on his face was replaced by tears and a trickle of blood from his nose. This is the point where the fantasy solution ends. But it illustrates the way parents can react when faced with school staff whom the bullies don’t fear. I don’t think anyone’s son or daughter should have to do this. It is the responsibility of the adults to control aggression. But when they feel they can’t use force, bullies without such inhibitions will rule. I say throw some fear into them. The use of force should be employed as a last resort. It represents a failure to deal with a situation early enough and effectively enough by other means. The forceful methods should be well planned in order to minimize damage to the recipient, although it is to be expected that the recipient will consider all such actions as damaging. Even though it is a last resort, the force must be imposed early enough to prevent the establishment of a behavior pattern which will require even more force to stop. Failure to use the necessary force to keep behavior within reasonable limits should be regarded as irresponsible leadership. Such a failure should be regarded as totally unacceptable. These guidelines won’t be put into practice as long as daycare centers and schools don’t have the mandate and the authority to maintain order. Until that day comes, the bully will rule.